Now you see, now you don’t! 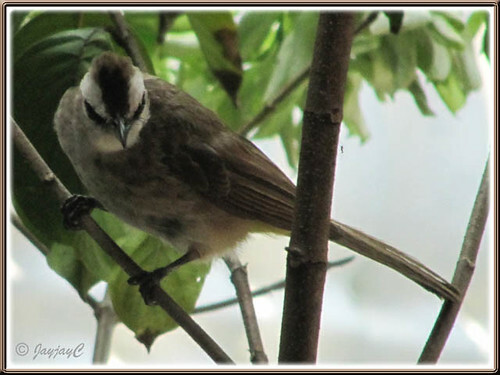 Watching the White-browed bulbul (Pycnonotus luteolus) Pycnonotus goiavier (Yellow-vented Bulbul) trying to start a family over and over again during the month of May can be debilitating! It was like a see-saw affair, experiencing fleeting moments of hope and joy, and then followed as quickly by sadness and despair for this species of backyard birds that just love to breed on our Lady Palm trees (Rhapis excelsa). And, definitely more depressing for the pair of love-birds who longed for babies, how heartbreaking it must have been! 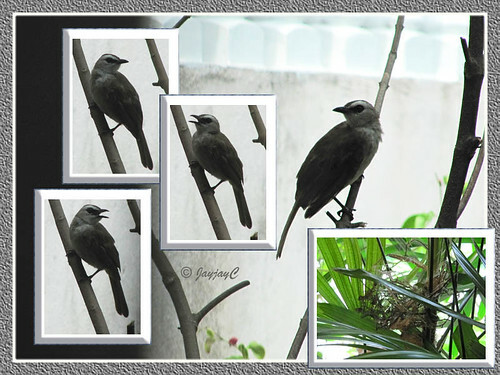 April 30: Nest-building by a pair of White-browed bulbuls (Pycnonotus luteolus) Yellow-vented Bulbul (Pycnonotus goiavier) on our potted Lady Palm trees at our frontyard took just 3 days to complete. Probably, this was the same pair that tried breeding in our garden last March, their 3rd attempt within 2 months! As seen in the collage below, the female seemed so contented as she placed the final touches to her home and tested the nest. We’re once again excited to be able to watch nature unfold just outside our tinted-glass door and be able to capture photos too. Praise and thank God for this nature surprises! 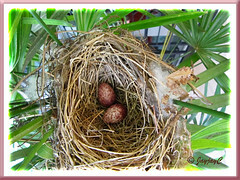 May 3: Upon our return from an outstation weekend trip to Ipoh, I took a quick shot into the nest on Monday morning, and was happy to see 2 lovely eggs in the photo. We were extremely excited for the would-be parents. Nevertheless, during the course of the day and subsequent days, we didn’t see the female or its partner around. 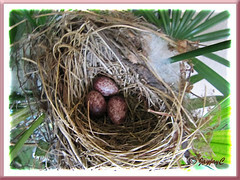 We thought that strange as it should be trying to hatch the eggs, because we recall a similar breeding event by the same bird species on the same Lady Palm trees, some 2 years ago at our garden porch. More than a week passed, without a sight of the pair though we can hear them making some noises occasionally from a very large tree across the road. Seemed to have abandoned the eggs, don’t know why? Google-searched for some answers and read that it’s best to leave the eggs alone. Most likely, they were not viable, birds know best! So sad! May 14: Then, 11 days later, our feathered friends (probably the same pair) came visiting again, seemingly very excited as we could hear from within our sitting hall, some happy noises outside. That got us as excited too! May 15-16: The next two days, we observed that the female was nesting ever so frequently. Is this the same one that had laid the two eggs and abandoned them? We dare not get close outside to see whether there were any newly-laid eggs inside the nest or just the previously abandoned eggs. She’s so alert and can see our movements inside our sitting hall as well, through our sliding glass-doors and laced-curtains. Sometimes, she will take flight even when we’re about 3 metres away, inside going about our chores…gosh, what sharp eyes she has! We kept our curtains closed most of the time to give her as much privacy as possible. May 17-21: Anyway, I just couldn’t contain my curiosity any longer as my gut feeling was that she had laid an egg or two. When the pair was out of sight, I took a ladder outside, climb it and took a capture of the nest. Wow! I was overjoyed to see that the nest now contained an additional egg! A treat too, to observe the female dutifully sitting on the nest, frequently throughout the day and subsequent days, assuring us that all was well. The male rarely visited the nest but was seen flying close-by with its mate and making ‘threatening’ noises whenever we garden too near. However, we greatly reduced activity outside to avoid agitating them. Hmm… our plants were obviously neglected for their sake. May 22-23: We’d do anything for our flying friends to succeed in raising their family this time around, but nature decided otherwise. The whole of Saturday May 22nd, the birds never came close to the nest even though we could see them perched once in awhile on the high-tension wires outside our home or nearby. Somehow, that didn’t seemed right. Early Sunday morning, I drew our curtains very slightly to have a peep at the nest and noticed that its edges were ruffled. Something was definitely amiss. Since there wasn’t any sign of the pair, I brought out the ladder and took a shot and almost fell when I saw that my image showed an empty nest! Only then, did I look down onto the floor beneath and saw pieces of broken egg shells. Ran in to disclose the sad news tearfully to my hubby who suspected that it could be the squirrel that had been seen quite often in our garden foraging for food. Simply shocking and so depressing…another unsuccessful attempt at breeding! Poor disheartened birds! We decided to remove the misshapened and ill-fated nest as it was now useless. May 26: Surprise…surprise! In mid-afternoon, a young pair of White-browed Bulbul on a recce mission seemed attracted by the very same spot that housed a bird’s nest just 3 days ago. 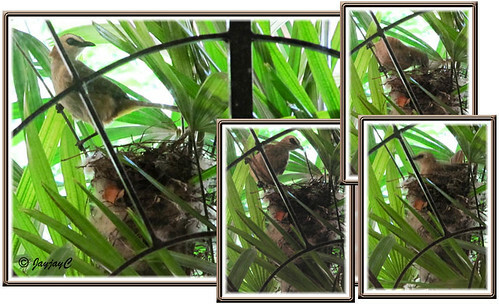 Without hesitation, they cheerfully started building their nest as I can see them landing on the Lady Palm trees every now and then from across the sitting hall where I’m working on my iMac. How lovely! May 27 The young love-birds were at it again the second day, continuing the nest building in the early morning. Lo and behold, danger loomed without warning! 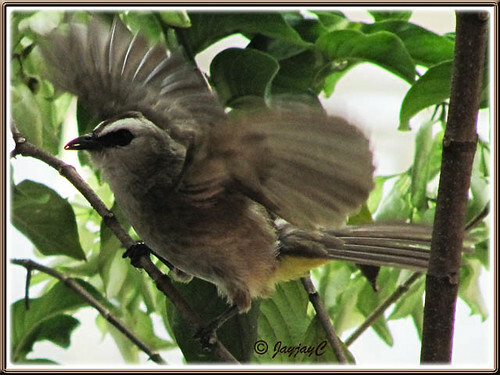 Out of the blue, another stronger pair of White-browed bulbul suddenly zoomed in and noisily chased off the innocent young pair at work and the latter never returned to finish their job. How very unfortunate for them and for us too who have hoped to experience another breeding event. Anyway, I was fortunate to have captured the ‘bullies’ with my camera and recognized them to be the earlier pair of bulbuls that had failed to fulfill their dreams. Poor confused dreamers. I truly sympathize with both pairs, nature can be cruel sometimes! A whole month of fluctuating emotions…one moment high-spirited and hopeful, and the next, low-spirited and down-heartened. That’s life, right? Whatever, we’re thankful to have experienced such blessed events. Bird-watching can been fun and exciting with joyful anticipation, though can be distressing at times, nonetheless! End of story? Hope not as we look forward to more visits from our feathered friends. 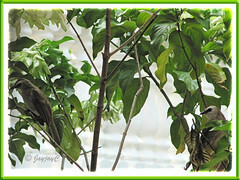 Will the same strong pair try to breed again at our home garden, we wonder? Celebrating New Year 2014 with arrival of feathered babies! If they are private and anxious as you say, then perhaps they do not like you repeatedly climbing up on a ladder to photograph the eggs in their nest. You might have better luck leaving them alone, so that you don’t risk scaring them away from their nest. Thanks for your kind advice, Carolyn. Nonetheless, be assured that the 2 occasions that I climbed up on the ladder to photograph the eggs on May 3rd & 17th were done very discreetly during their absence. The female wasn’t even aware of my climb since she continued nesting on her eggs for 5 more days after that! Its a pity that the squirrel had torn down the nest. 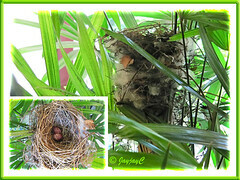 But truly, its really an exhilirating moment to see birds nest in one’s garden. Indeed, James! Sad and happy, opposite sides of the same coin!